The Boycott, Divestment, and Sanctions movement (BDS) has expanded rapidly though controversially in the United States in the last five years. The academic boycott of Israeli academic institutions is a key component of this movement. What is this boycott? Why does it make sense? And why is this an American Studies issue? In this short essential book, Sunaina Maira addresses these key questions. Boycott! 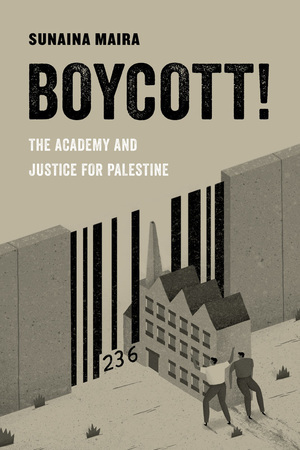 situates the academic boycott in the broader history of boycotts in the United States as well as in Palestine and shows how it has evolved into a transnational social movement that has spurred profound intellectual and political shifts. It explores the movement’s implications for antiracist, feminist, queer, and academic labor organizing and examines the boycott in the context of debates about Palestine, Zionism, race, rights-based politics, academic freedom, decolonization, and neoliberal capitalism. Sunaina Maira is Professor of Asian American Studies and was Co-Director of the Mellon Research Initiative in Comparative Border Studies at UC Davis from 2015-2018. In addition to Boycott! The Academy and Justice for Palestine, she is the author of several books on Muslim, Arab, and South Asian youth culture and activism including Jil Oslo: Palestinian Hip Hop, Youth Culture, and the Youth Movement and The 9/11 Generation: Youth, Rights, and Solidarity in the War on Terror. She co-edited Contours of the Heart: South Asians Map North America, which won the American Book Award, and The Imperial University: Academic Repression and Scholarly Dissent. Her current research is a community-engaged project on sanctuary activism and migrant solidarity movements in the US and Europe. Maira has also been involved with various community organizations and Palestine solidarity campaigns in the Bay Area and nationally. This entry was posted in MRSCP and tagged Apartheid, Boycott, Event, Free Speech, Human Rights, Israel Lobby, Video by admin. Bookmark the permalink.